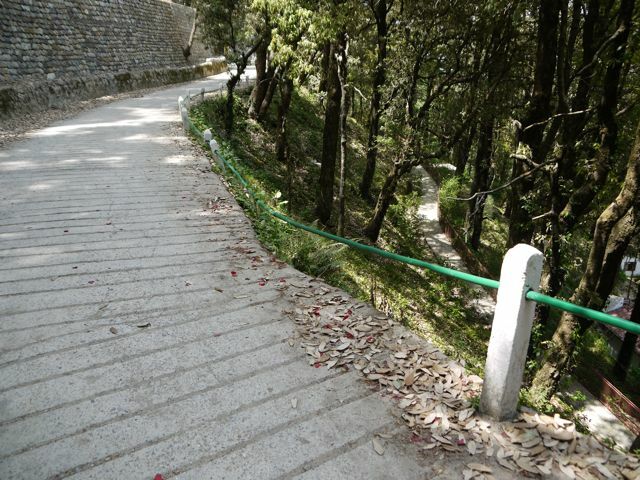 The road at the top of Landour hill is called the chukker (chaker, other variant spellings). 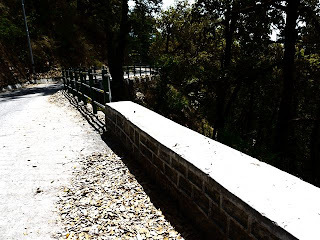 It goes the length of the ridge from Char Dukan on the west (Mussoorie side) to Sisters' Bazaar on the east (Jabarket side). There are two circular back chukkers that meet at Kellogg Church near the center of the hill. The road up to Char Dukan from Mullingar is having its side railings replaced. For many years knee-high stone and cement walls have bordered the road, but there are many places that are crumbled. 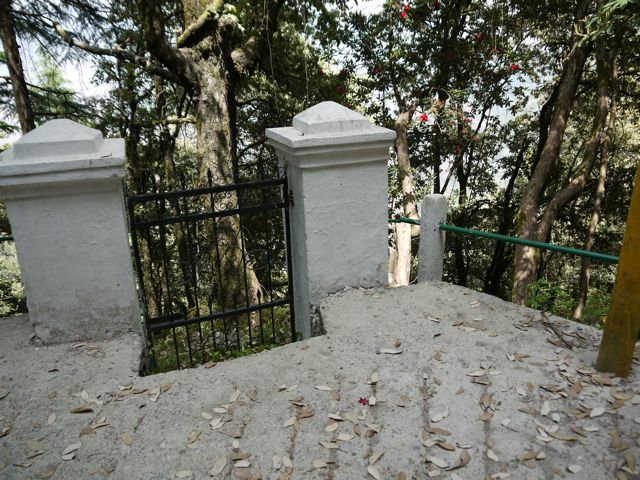 They are gradually being replaced by a taller, stronger steel railing. I don't know if they will make it safer; it seems that cars never go over the side of this road, narrow as it is. 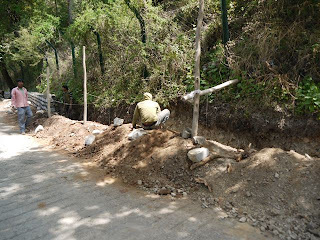 Heading around the back side from Char Dukan, these men were digging a ditch, I believe in preparation for more pushta work, a constant chore. 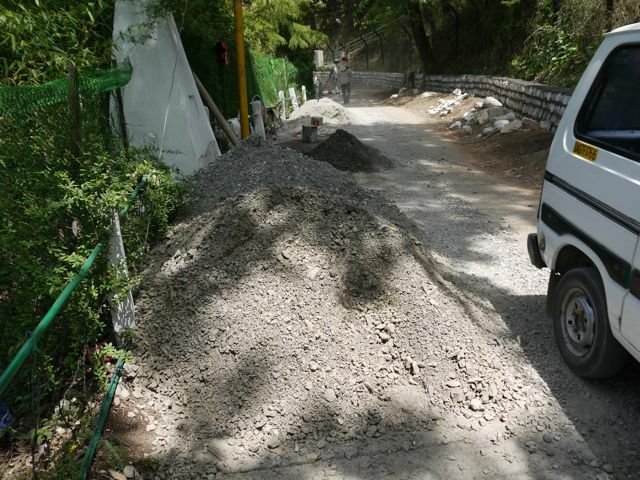 The road is quite narrowed by the piles of gravel and stone waiting to be used. 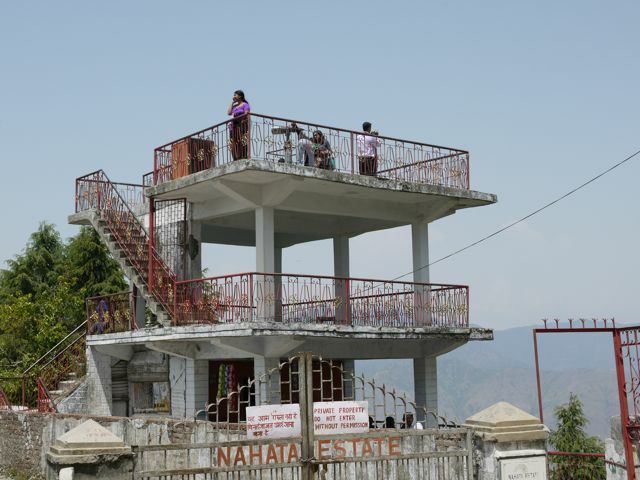 At the furthest back (north) point, this structure is the "New Lal Tibba." Years ago a high point above Sisters' Bazaar was named Lal Tibba and people would climb up there to see a view of the high snow-covered peaks to the north. When a TV tower was built there in the 1970s, this structure was built. There is a binocular on the top that you can pay to look through and see the snows. The day we were there the haze was heavy and no peaks could be seen. But tourists come anyway. This railing along the back chukker must have been put in years ago. 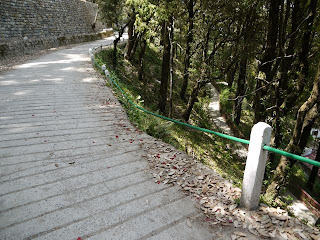 Over time, the road has been paved and built up and the railing is now so low that it can do no possible good. This gate to a property also has been lowered over the years. It makes an odd sight. 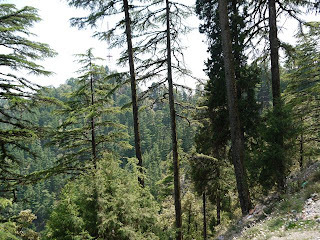 After passing Lal Tibba it is much quieter. 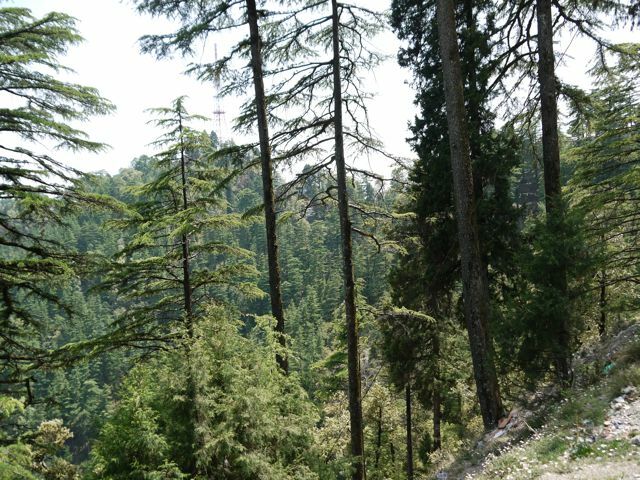 On the north slope of Landour hill, the deodar forests are beautiful and peaceful.